The question of equality underlies almost all discussions around discrimination. The proposition is that all human beings are equal before the law but the dilemma is that we have a tendency to view the other as somehow being less thanen someone who belongs to the other category (other skin colour, other nationality or culture, other sexual orientation, and so on) we see many examples of how we as a society, place a lower value on the rights of those others. I often juxtapose conversations of equality and discrimination using race and sexual orientation (for the purposes of this discussion, I've chosen these topics but note that discrimination and equal rights issues are far more broad). Discriminating against people who have different colour skin is just as offensive as discriminating against people who have different sexual orientations, but they are often regarded as being two separate arugments. The reason I present the juxtaposition is that racial discrimination is (relatively) easily challenged using legal, moral and scientific arguments. 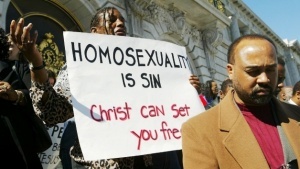 However, the most common argument proposed against homosexuality is a religious one. Why is this? Why can we find it in ourselves to say that racial discrimination is offensive but that discrimination against homosexuals must be tempered with respect because it comes from a religious viewpoint? What do we mean when we say that all human beings are equal? Do we really mean that when we say it? Maybe we do. Do we really believe it? I'm not sure about that. How do your own thoughts on morality affect your treatment of patients? Have you ever had to treat someone whose behaviour you found morally repugnant? How did you deal with the dilemma? Do you struggle with to provide equal care for all your patients, even those whose behaviour is unacceptable to your belief systems? Do you question the source of your morality? Of your innate beliefs about what is right and wrong? How do you manage situations where conflicts arise? For example, when your sense of what is right or wrong is in conflict with the law?